NAD made its name with budget amplifiers and its presence in that market continues to be strong. More recently, it has added the upmarket 'Masters' range – considerably more expensive products with more refined sounds and looks. In terms of hi-fi separates, though, there has been quite a gap between the ranges – a gap which the new 375BEE goes some way towards closing. But is it just more of the same stuff that goes in the cheaper amps? Not according to NAD, which claims this amp is, in fact, closer to the Masters series M3. 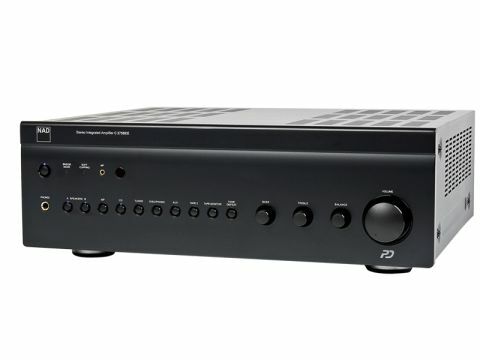 Among other Masters-type features, it uses a 'building block' approach for upgrades, including an optional phono stage (£70), which NAD supplied to us for this review. We noted in fixing the phono module that there is a second expansion port, but as yet no product has been announced to fill it. A DAC, perhaps? As the photographs clearly show, this is a pretty big chunk of amplifier. That's not surprising when one considers its specification, which includes a power rating of 150 watts into the usual 8 ohm notional impedance. NAD makes great play of its 'Full Disclosure' power specification, welcome in these times of 1,000-watt desktop audio, though most proper hi-fi companies certainly don't stoop to such depths. Still, in practice this means NAD's specifications are distinctly conservative. We ran a few tests on the 375BEE which showed its continuous power delivery (driving two channels) to be barely a whisker below 200 watts, while a shade over 220 watts is available into one channel at a time and brief peaks (up to about 50ms, which is enough for most real-world musical transients) of 250 watts can be supported. This kind of power puts a strain on the internal workings if they aren't robust. But there are no such worries here as four pairs of output transistors per channel are in circuit, sharing the high output currents quite safely. They are mounted on large heatsinks and fed from a substantial toroidal transformer and a pair of very large reservoir capacitors. This approach means that sustained high power delivery is not an idle boast: just about the only disadvantage (apart from the obvious ones of size and cost) is relatively high power consumption at idle, but this is still only in a region of 60 watts, similar to the 375BEE's obvious competitor, the Cambridge Audio 840A. In common with many large-scale audio manufacturers, NAD is still using through-hole components for most of its circuits. The circuit boards of the two discrete power amplifiers (separate back to the mains transformer) are well filled with parts, while the single board mounted on the base is home to the relays, which switch inputs and outputs, various power-supply parts and also a couple of completely enclosed 'class A gain modules', which are evidently NAD's answer to the ubiquitous op-amp. Gain control is still a motorised potentiometer, with tone and balance controls alongside – defeatable, of course. Inputs and outputs are plentiful, with a preamp output for bi-amping. The amp can be bridged if you really need 500 watts or so of output, in the company of a matching 275 power amp similarly connected. Incidentally, as well as measuring output power we checked basic distortion and frequency response figures. They are all very impressive – midband distortion staying in the region of 0.001 per cent even at 200 watts output. That's not a trivial thing to achieve and we congratulate designer Bjorn Erik Edvardsen (the BEE suffix) on doing so.